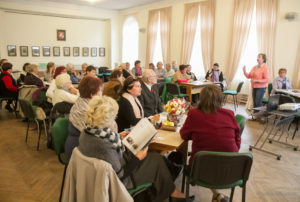 The Mobility Scouts Project was closed on 27 September in Kaunas. 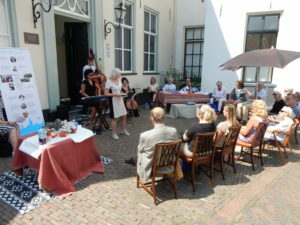 The format of the final event was the quiz game on age-friendly environments. 32 people from community centres, seniors’ organizations and clubs attended the event. 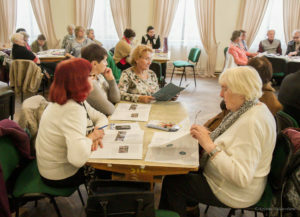 The event focused on presenting the results of Mobility Scouts project, raising awareness on the issues of age-friendly environment and sharing the activities of Mobility Scouts in project partners’ countries. Sensitisation handbooks were handed out to event participants and leaders of organisations and seniors’ clubs were also introduced to the Mobility Scouts approach and the training model described in detail in the Handbook to Practitioners. A quiz game was organised in the second part of the event. Six groups competed in answering questions on age-friendly environment, accessibility issues and silver economy. All participants received consolation prizes from a wholesale and marketing company Vilandra and the winner team received USB memory sticks with uploaded Mobility Scouts e-publications. 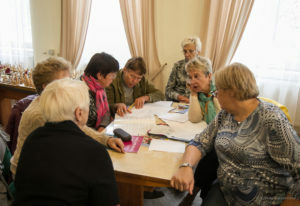 The participants enjoyed the possibility to discuss important issues of accessibility and age-friendly environments and listened to experiences of Mobility Scouts with great interest. 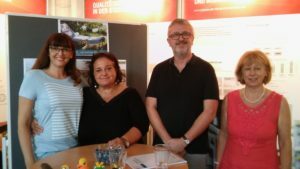 On the 20th of September 2018 queraum and the Mobility Scouts organised the National Networking Event in the “Planungswerkstatt Vienna”. The main idea of the National Networking Event was to link up Mobility Scouts and relevant stakeholders at local level. 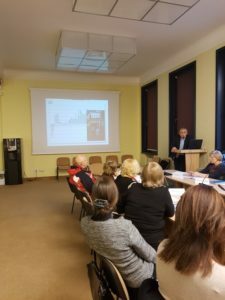 According to the participatory approach of the project, Mobility Scouts were actively involved in the organisation and realization of the event. 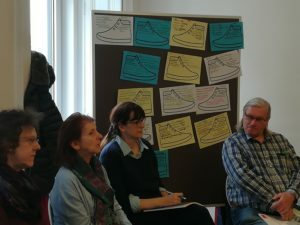 After a short introduction of the trainers, Mobility Scouts presented their local projects: Danube Island – towards a barrier-free recreation area, Safety in the traffic system and Mobility unlimited. Six local cooperation partners (head of the Seniors Office Vienna, representative of the Municipal Department 19 – architecture and urban design, expert of the Mobility Agency Vienna, Austrian Road Safety Board, head of the Local Agenda 21, project manager of Caritas – district work) formed an advisory group and provided feedback and practical tips. All in all it was a very appreciative exchange of ideas and Mobility Scouts, cooperation partners and the audience gained a lot from the discussions. Celebrating the success also got its due: The head of the Seniors Office Vienna handed over certificates to the Mobility Scouts and thanked once again for the valuable contributions. 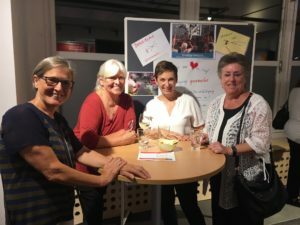 During a social get-together with drinks and snacks, participants were invited to learn more about the local projects, participate in a “safety quiz” and show their balance and dexterity on a parcour. In total 41 people participated in the event, which was much appreciated. 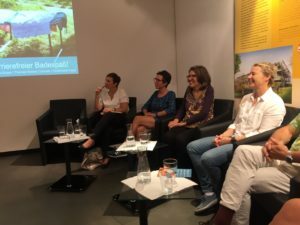 The `Wiener Zeitung’ published a comprehensive article on our Mobility Scouts project and presented local projects of our Mobility Scouts in Vienna. Interested in experiences of our Mobility Scouts? Read more here (in German). 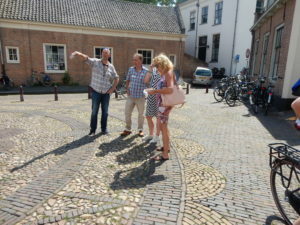 In Zutphen, the district manager of the inner-city invited the Mobility Scouts project team to organise an ‘activity’ about Mobility Scouts/age-friendly Zutphen during a Meet-up of the national association of professionals working as district / regional managers (www.lpb.nl). 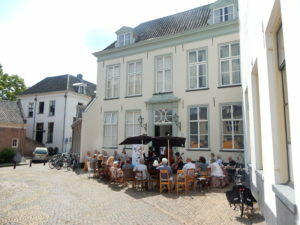 At the 28th of June, a ‘public living room’ was set up, at a square in the city center. Neighbours (older people) and people who passed by were invited to join, have coffee or a soda and meet with participants of the Meet-up. 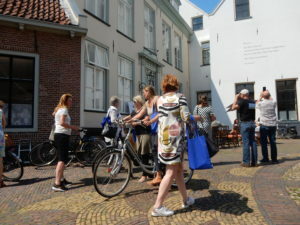 The group of professionals made a city tour by bike, visiting all kinds of ‘good practices’ of civil participation. They arrived a few minutes later, by bike, and were invited to join in. 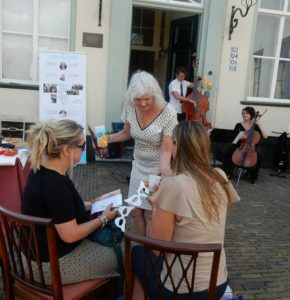 Laura Christ and Inger Luijten informed the participants about Mobility Scouts, the ‘bottom-up age-friendly approach’ in Zutphen. 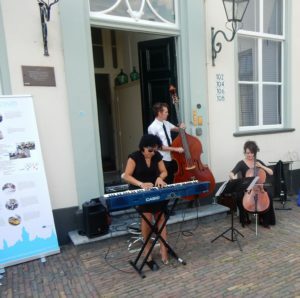 Then, everyone was invited to look at the environment through ‘age-friendly glasses’ while having a drink, chatting with the neighbours, walk around, enjoying the live music (electric piano, cello, contrabas). The message is: ‘look beyond the outside and the beauty of the place and think about issues that are important to the people who live around the square/in the inner-city. 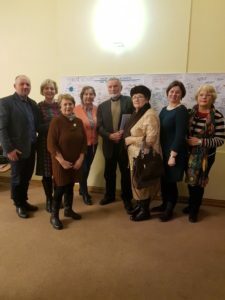 The district managers were challenged to come up with ideas how local authorities/ district managers could facilitate and support active engagement of older people concerning age-friendly development, design and accessibility of public spaces. The ideas were shared and written on the tablecloth. At least 30 people attended this activity that was much appreciated! Please find the program here. Participation is free of charge, but participants themselves should cover any expenses related to travel, accommodations and allowances. Considering the limited number of seats in the meeting room and safety regulations in the Committee of the Regions, we kindly ask you to register here. The National Networking Event – with the title Cambiamenti climatici, politiche di mobilità e qualità dell’aria nelle grandi città italiane (Climate changes, mobility policies and air quality in the Italian big cities – has been organized in cooperation with Kyoto Club and its Sustainable Mobility Working Group and took place in Rome on the 16th of February 2018. Rome Mobility Scouts participants and partners as well as local, regional and national mobility decision-makers and companies have taken part and during the event details of the Mobility Scouts activities have been shared and the Mobilitaria 2018 Report, prepared as part of the Mobility Scouts project, has been presented and discussed. 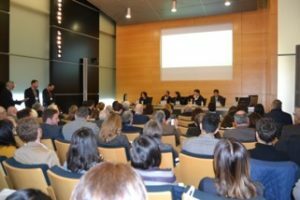 All event presentations, as well as the Mobilitaria 2018 Report, are available here. Inspiring start of the Mobility scouts Training Vienna! 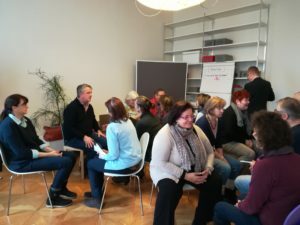 The first workshop of the Mobility Scouts Training in Austria was a big success. A very heterogenous group of 14 participants started their adventure “Mobility Scout”! The next workshop will take place soon. 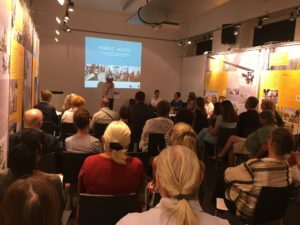 The European Commission revealed the finalists of the EUROPEANMOBILITYWEEK Award and the Award for Sustainable Urban Mobility Planning (SUMP). The EUROPEANMOBILITYWEEK Award showcases local authorities that demonstrate significant efforts in promoting sustainable urban mobility, while the SUMP Award recognises outstanding sustainable urban mobility planning. Interested in who is nominated? Have a look here.